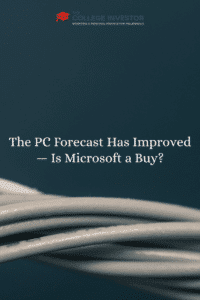 Home » The PC Forecast Has Improved — Is Microsoft a Buy? Microsoft (NASDAQ: MSFT) continues to make changes at the organization and there have been some positive trends. The stock is up over 35% over the past year and we have written positively about it before here. However, there are increasing concerns that upside is limited and challenges remain. First, declines in PC sales have hurt Microsoft and weigh on the stock. Also, it needs to cut costs, and integrate its recent acquisition of Nokia. 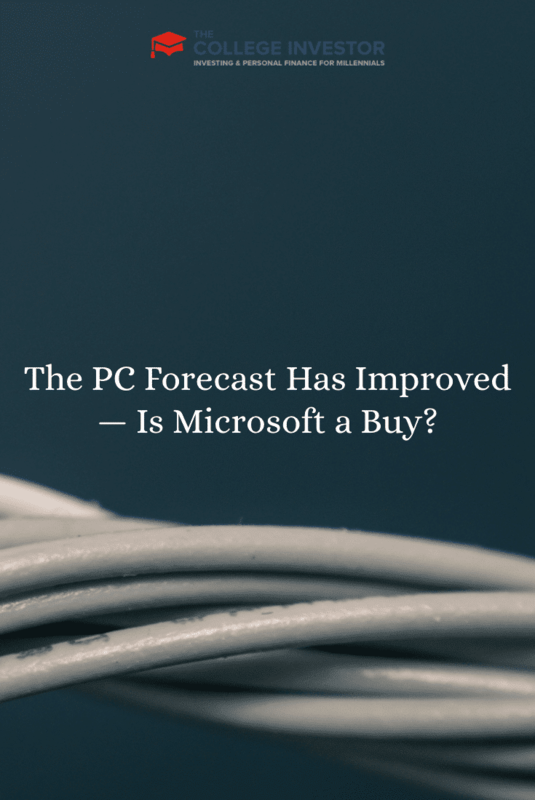 Positively, PC shipments may stop acting as a headwind for Microsoft based on recent forecasts. While this market will remain soft, it will give Microsoft time to further reduce costs and grow its more attractive businesses like Cloud Services. In addition, its dividend payouts and FCF generation are positives for investors. Here is a look at the current outlook for parts of the business to help investors decide if it’s a time to buy. Over recent years, global PC and laptop shipments have steadily declined. In 2013, Gartner data indicated PC shipments were down by 10% over the prior year. The growth in the tablet and smartphone market has negatively impacted PC sales. In addition, the replacement cycle for PCs for both professional and personal use also slowed. Technology lasts longer and the need to have the latest and greatest processor has consistently declined. The decline in shipments has presented challenges for many stocks. Hardware manufacturers like Dell, HP (NASDAQ: HPQ), and Lenovo have all faced challenges. In addition, Microsoft has faced challenges and its earnings are impacted by the slower upgrade cycle and substitute demand for tablets. On August 20, 2014, Goldman Sachs updated their forecast for PC shipments and increased their expectations for 2H14 and 2015. It now estimates 310 million shipments in 2015, or a 0.1% increase over 2014 levels (−1.5% YOY). Previously it estimated 301 million shipments. The stabilization of this market is important to the hardware manufacturers and to Microsoft. It receives licensing fees for its Windows OS and other software every time a PC is sold. Revenues from PC-related sales may no longer face this headwind, and that is a positive for the stock. Microsoft will benefit from slow improvement in PC shipments but also from the Windows XP migration. Earlier this year, Microsoft stopped supporting and offering updates to Windows XP. This has forced businesses to either upgrade to newer versions of Windows or upgrade all their systems. This was a tailwind in 2Q14 and should remain one into 2015. Data from IDC supports this with commercial PC sales up 2.2% in June whereas consumer was down 4.2%. Consumers place less emphasis on the need for security and other support. This supports the case that businesses will refresh older hardware which is positive for earnings and sales at Microsoft. Microsoft had less success in tablets and this market is less important to earnings. While Goldman Sachs moved up its PC forecast, it did decrease estimates for tablet shipments. While this mix change is negative for Apple, it is less impactful on Microsoft and the overall dynamic is a positive one. GS estimates −9% and −14% YOY growth in 2014 and 2015, respectively. Apple will bear the brunt of this with estimates for −12% and −25% in this year and next year. Windows-based tablets are forecast to decline by 9% in both years but gain some market share at the expense of Apple’s iPad. Microsoft returned around 40% of FCF to shareholders in FY12 and should return about 60% in FY14. Microsoft has stable cash-flow generation and it has increasingly looked to return more FCF to shareholders every year. Some analysts estimate FCF should expand at an average of 10% annually over the next five years, increasing Microsoft’s ability to repurchase shares and pay dividends. Dividends and repurchase activity should increase in line with FCF growth. Its dividend yield is above the peer average over the past 10 years and increased from 2.8% in 2012 to 3% currently. Winning in the cloud market and establishing a leading position there is critical for the future at Microsoft and other tech firms. Amazon (NASDAQ: AMZN) has enjoyed great early success but Microsoft’s cloud business is accelerating. This business beat analyst expectations in the most recent quarter. The Commercial Other segment which includes Cloud Services, Enterprise Services, Dynamics CRM Online, and Windows Azure was up 44% YOY. Office 365 and Windows Azure, both cloud services, led to the increase. The ongoing success of the cloud can drive revenue and margins higher at Microsoft. While there is some reason to be more positive on the outlook for Microsoft, it does still face long-term challenges. The most compelling reason to own it remains its ability to generate cash and return it to shareholders. The stock trades at 14.1X NTM earnings, which is not cheap for it. While there are some positive changes in its end markets, investors should look for pullbacks.